Cultivar Brasil [breakfast, brazilian, snacks]: to experience two of Brazil’s most famous foods, açaí bowls and pão de queijo, this is your place. The perfect spot to rest your feet on a walking tour of the Santa Teresa neighborhood. Lapamaki Temakeria & Sushi Bar [sushi]: Stumbled in for the wifi, stayed for the greatest (and cheapest) sushi meal in memory. Turns out Rio is teeming with sushi joints, and Lapamaki was the highlight of all that we visited. The raw salmon was piled on heavy, and the rice seasoned to perfection. Order any of the temakis (kind of looks like a sushi ice cream cone) to get you fish fix, and expect to pay equivalent of $15 USD pp for a feast. Aprazível [brazilian]: I’m not usually a fan of $$$$ restaurants, but when on vacay: treat yo’self. The menu is centered around fish and each dish resembles what you’d find at any five-start establishment in New York. The cashew milk cerviche was a highlight. You’ll need to make a reservation (we got lucky without one) and best to ask for a table with a view. 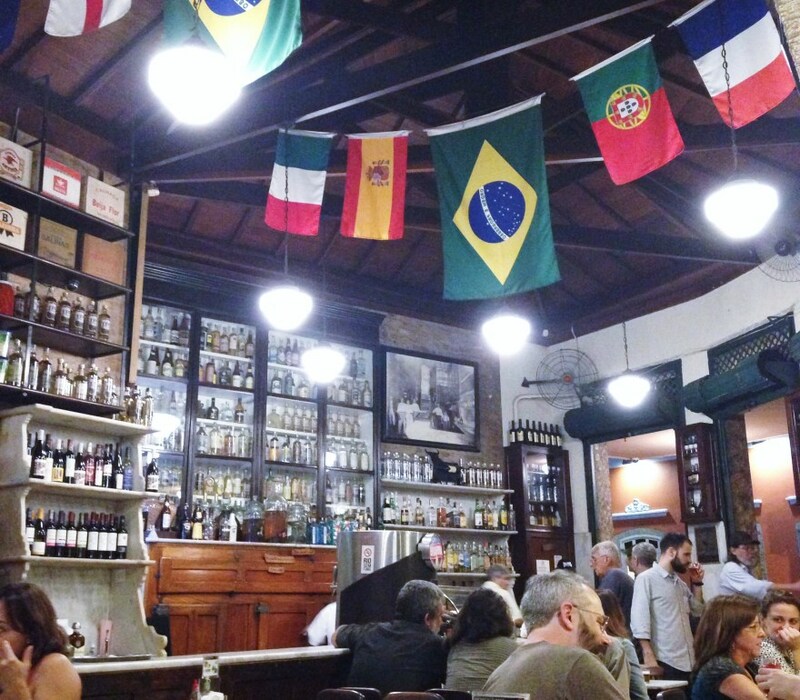 Armazém São Thiago [bar, cafe]: One of Rio’s oldest and most famous establishments, “Bar do Gomez” has managed to maintain a genuine air of charm and authenticity. A crowd mixed with tourists and the most eclectic of locals, this place was a second home on our trip. Try the “pork carrots” and ginger caipirinha, and finish with a their “chop,” the house beer on tap. Santa Teresa [neighborhood]: This artistic hub exudes history at every corner with colonial mansions lining the streets. Ditch anyone’s advice to stay in lackluster Ipanema, and base yourself in ST. It’s got sights, food, bars, and is centrally located – and most importantly it feels like you’re actually staying in Brazil, not Florida. Lapa [neighborhood]: In the day, this somewhat grungy neighborhood is a mix of traffic, smells, and cheap eats. However, on a Friday night this neighborhood turns into Rio’s biggest party, boasting street food and ample drinking in public. Whether in a bar or on the curb, you’ll be set as long as you have an Antarctica (beer) or caipirinha in hand. Mirante Dona Marta [view point]: You’ll notice that I did not include the Christ Redeemer (that giant Jesus statue) on my list – and that is because we didn’t go. Between the unpredictable weather and hoards of tourists, the Christ seemed out of line with our usual holiday activities. Instead, we went to Mirante Dona Marta, a view point just below the Christ (so you can still see the big guy), minus all the tourists – and it was free! To reach it, catch the bus 006 or 007 and ask the driver where to get off for MDM; you’ll then have a quick hike along the road through the forest to get there. Pista Cláudio Coutinho: Walk in the shadow of Sugarloaf Mountain, then if you’re game, hike up to the first peak of Sugarloaf. It only takes about 30-40 (very hard) minutes to get to the top, and it will save you the pricey admission fee you have to pay if you were catching the gondola. 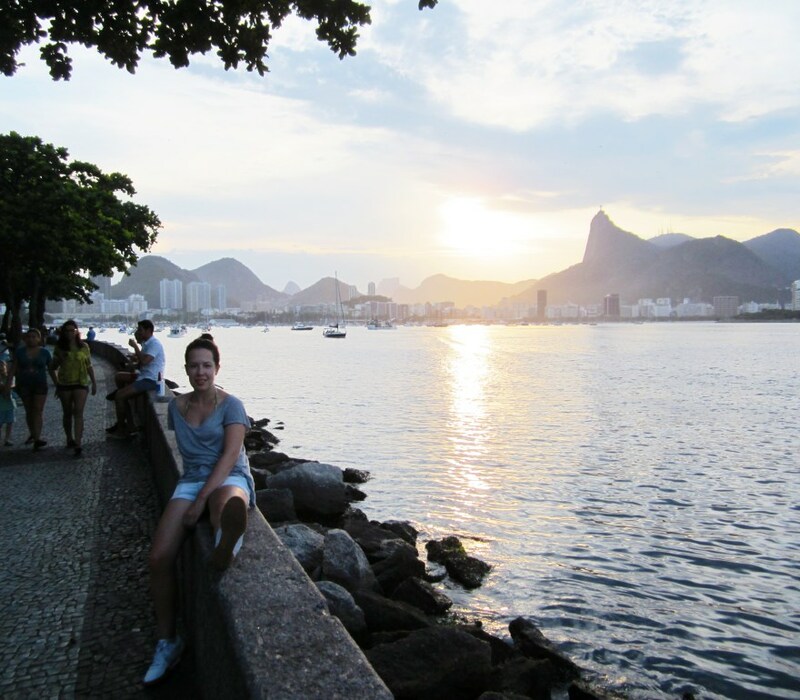 Urca [neighborhood]: After hiking Pista Cláudio Coutinho, head to Urca to catch an unbeatable sunset along the bay. Quench your appetite with beer and food from local restaurants surrounded by hundreds of residents and tourists alike. Primatas Waterfall: Trek through a tropical jungle, followed by a swim in a waterfall. You won’t find this reco on anyone else’s list – in fact, most locals don’t even know it exists (we were clued in by our Airbnb hosts). To get there, plug in “499 R. Sara Viléla” into your Google maps, and then walk up the hill to the start of the path. It’s about a 30 minute hike into the waterfall. Parque Lage: Pair your trip to the waterfall with a stop at Parque Lage. It can best be described as a botanical garden filled with random sculptures and gems, including a hidden aquarium with piranhas and other tropical fish. Centro Cultural Municipal Parque das Ruinas: The shell of a colonial mansion burned to the ground, renovated with modern art and sculptures. I has fantastic views of the city, and best of all: it’s free. Escadaria Selarón, or “Seralon Steps”: Rio’s famous colorful steps. Visit as part of your trip to Lapa or Santa Teresa. Ipanema [neighborhood]: Touristy as they are, the beaches of Ipanema are still enjoyable and a fantastic place to people watch. Spend a day bronzing in you teeny-weeny bikini while food vendors offer up freshly grilled cheese on a stick and caipirinhas. Some people enjoy the main shopping areas, but I would give them a miss – they’re uber touristy and the same as you will find in any generic shopping location. Copacabana [neighborhood]: good for one night out, but not much more. Ewa’s Airbnb: One of the best Airbnb experience I’ve ever had was at Ewa’s. For around $35 USD a night, you will get to stay in a beautifully renovated historic mansion right in the heart of Santa Teresa. Included in the stay is a comprehensive breakfast of Brazilian fruits, freshly baked bread, and charcuterie. You can get $40 off your next Airbnb booking by using this link (that's a free night at Ewa's!). Post updated on August 1, 2018.